Day 29 of the 90 Days of Awesome is in the bank! What made today awesome? I had lunch with a new friend at Fez during Independents Week (not a typo). I received a request to meet with a fellow lawyer who is new to Arizona and starting a solo practice. He wanted to hear about my experiences starting a firm and marketing myself with social media. It’s always fun to chat with receptive lawyers about what’s working for me with social media. This guy was brand new to the valley so I got to give him an overview about networking in the Phoenix area. They’re on the light rail – which would give my friend a chance to try public transit. They’re members of Local First Arizona – great way to introduce this organization to him. 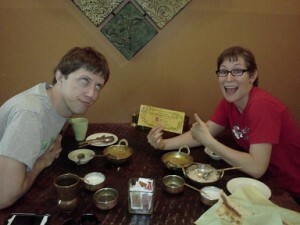 And they’re accepting Golden Coupons during Independents Week so we got 20% off our bill. I enjoy Independents Week. It’s a week to focus on spending your money at locally-owned businesses so more money stays in the community. It may seem strange that I (an aspiring minimalist) get excited about a consumerism-focused event. But there is method to my madness. Carter Law Firm and Venjuris are members of Local First Arizona, and I believe in keeping my money in my community. Although I’m not a recreational shopper, I do buy things. Shopping during Independents Week with the Golden Coupon to buy things I’m going to buy anyway lets me get them at a discount. With nearly 3,000 businesses belonging to Local First Arizona, it’s hard to keep track of everyone. Seeing the list of companies that are accepting Golden Coupons is a reminder of some of the awesome local businesses in this state. In case you missed it: Day 28 of the 90 Days of Awesome was Less than Awesome. 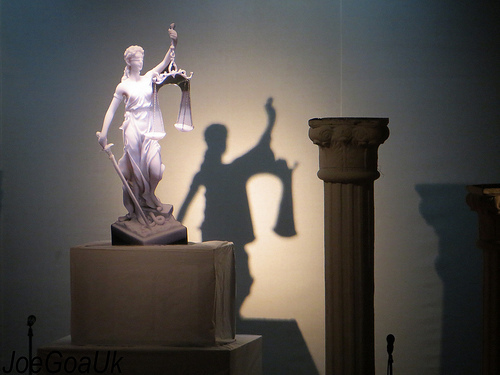 Independents Week 2014 – Who’s In? I’m excited for Independents Week next week (6/29 – 7/6) and I hope you are too. This is the week where you’re encouraged to spending your money locally. When you spend locally, more of your money stays in the community compared to when you shop at big box stores – a lot more. I participated last year and had an awesome time shopping at some of my favorite businesses in the valley and trying out some new ones too. 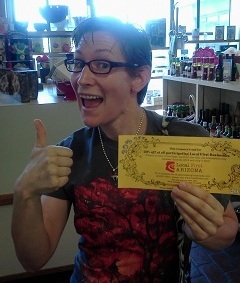 Independents Week is also Golden Coupon week. Members of Local First Arizona will be offering 20% discounts when you shop with a Golden Coupon. (See their site for details and limitations.) Over 260 businesses all over the state are participating. It’s a great reason to try a new place in your neighborhood. These are some of the places in metro Phoenix that I’m excited to see are participating. I’m sticking to Phoenix area places because, well, I live here. Some of you might be asking, “How does being a minimalist comport with Independents Week?” To me, being a minimalist means I try to only buy things that add value to my life. I still need to buy things. I think Independents Week is a great reason to pop into places you wouldn’t ordinarily visit to get to know them. (It’s important to me to spend my money locally when I can.) These places might have things that would add value to my life – now or in the future. There’s no pressure to buy anything this week, but if I do, I get a nice discount. If you do participate in the Local First Independents Week Golden Coupon program, you’re eligible to enter to win a staycation in Flagstaff. Why am I telling you that? Shop with the Golden Coupon but don’t enter the contest. You’ll be hurting my chances of winning. Happy Independents Week! Who’s in? 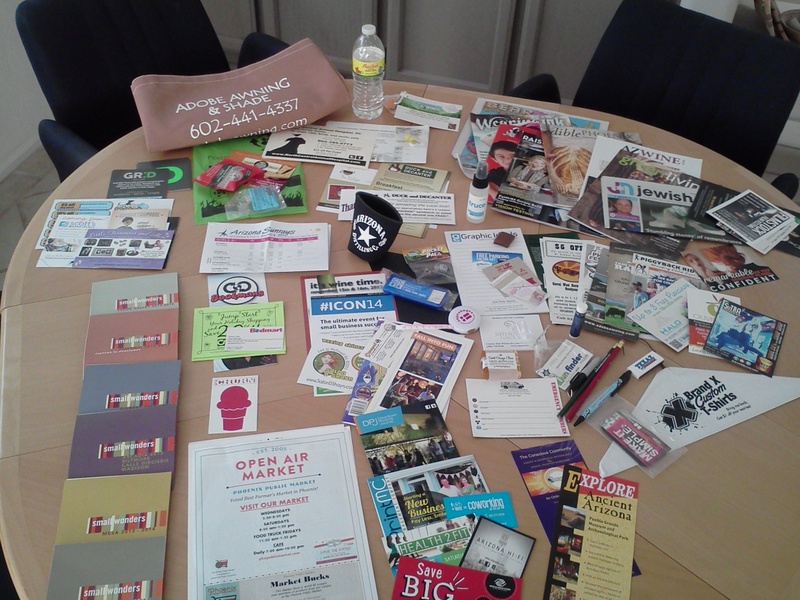 As a business owner, I know that having schwag is one way to promote the company. The right schwag can help keep you top of mind with your customers if it’s something they’re going to look at on a regular basis. In my first year in business I went to a schwag expo where I saw dozen of vendors who could put my name and logo on just about anything – pens, Frisbees, shirts, water bottles, notepads, mouse pads, toys, etc. 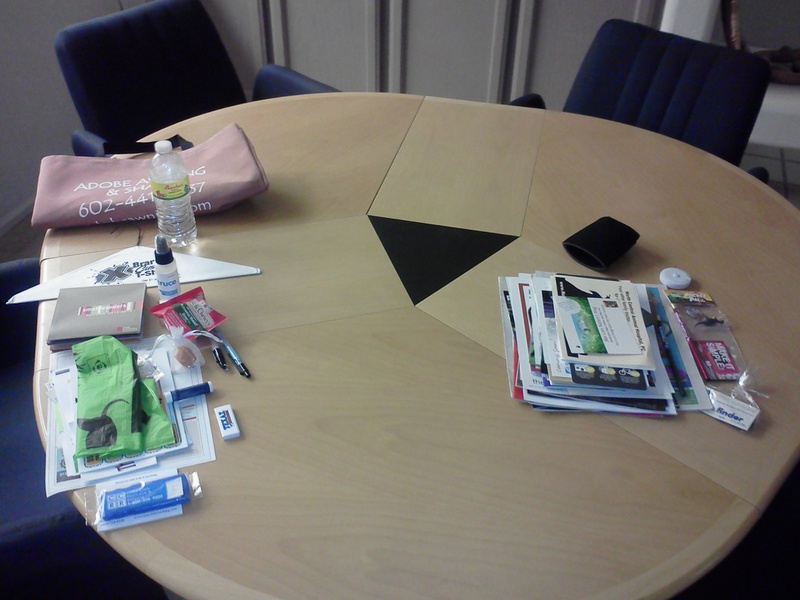 Here’s my challenge with schwag: a lot of companies have crappy schwag that’s either cheap or something I’ll never use. When I go to business expos, the most common thing I take from businesses’ tables is candy. I refuse all company literature and schwag unless it’s something that I think will benefit me in some way. Because of this, I’ve spent a lot of time thinking about what type of schwag I would want to give out. I belong to Local First Arizona and they have an annual Fall Festival where they give out schwag bags to 500 attendees. It seems like a good opportunity to create some schwag and see what kind of effect it would have. I have my company postcard, but I wanted something that was more useful on a day-to-day basis. A fellow Local First member, HP2, is a schwag company and they have thousands of options. I poured through their catalog and ultimately decided on company lip balm because it’s something I use several times a day. I rarely leave the house without it. I went to the Fall Festival and I got there early to make sure I got a schwag bag. I wanted to see what other people were giving out, and to be honest, I only had 500 lip balms made, so I had to get a schwag bag to get my own schwag. Local First promoted the fact that the schwag bags had 60+ pieces of schwag so I was excited to get home to see what was in the tote bag. I was mostly disappointed by my fellow contributors’ lack of creativity and usefulness. Local First did a good job of encouraging companies who were contributing to the schwag bags to give something other than a flyer or business card, so I was surprised by the amount of paper that was in my bag. Not all paper is bad – there were some coupons, business cards, and flyers in there for places I want to visit. (Some came in the bag and I picked up some at the tables during the festival.) I also kept the notepad, my company lip balm, soap samples, matches, and the Local First Small Wonders Maps. But not all tangible schwag made the cut. Into the give-away-or-throw-away pile, there went a beer cozy (don’t drink), a dinosaur toy (don’t need a toy), a bottle open (don’t need), a tape measure (already have 2), and two regular pencils (I use mechanical ones). I will probably always have a mental conflict related to schwag. I want my name to be out there, but I don’t want to give people crap they don’t need, especially since I’ve started integrating minimalistic ideas into my life. Having schwag is probably part of the cost of doing business, but I hope to never be someone who pushes it on people who don’t want it. I had an awesome time during Independents Week 2013. 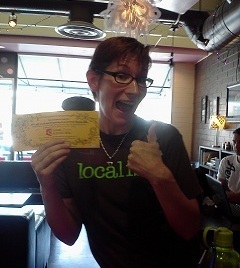 Over 300 members of Local First Arizona offered 20% discounts to patrons with Golden Coupons. Here’s the rundown of every place I visited last week. Apparently if you went to high school in the Phoenix area in the 90’s, Zia Records was your go-to place to buy and sell movies and music. The shop was huge and had a massive variety of products, including a ton of pop culture paraphernalia. I wished they arranged the DVDs in the sales bins so you could read the spines and not have to flip through each case. 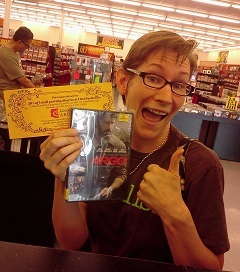 I walked out with a copy of Argo – one of the movies on my “must buy” list. Anyone who knows me knows that I love ice cream (ICE KREM!) I’d never been to Pink Spot and Indie Week gave me a chance to check it out. They have a limited selection but a lot of creative flavors. I also enjoy the inviting quiet ambiance of the place. 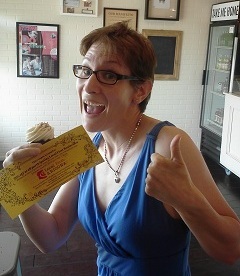 When I heard that Urban Cookies has gluten-free cupcakes I knew I had to check them out. It was a moist chocolate cupcake with vanilla buttercream frosting. It was heavenly. The shop is adorably tiny and the staff is super sweet. This stationary and gift shop has been part of my family for decades. 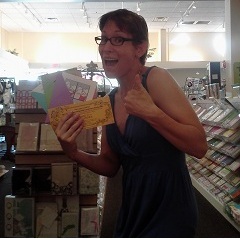 It’s the only place I go for greeting cards. Indie Week gave me an excuse to stop by and stock up. 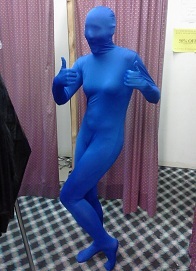 Ever since I saw a head-to-toe spandex body suit, I wanted one. My partner-in-crime and I have had several discussions about what types of flash mobs and pranks we could do with these. Arizona Fun Services is the only shop that has ever let me try one on. They didn’t have the colors we wanted in our sizes but they took our names and numbers and will let us know when they get their next shipment. This costume shop is huge with a wonderful selection of costume pieces. I will definitely be back. I fell in love with this Indian restaurant when I came here for lunch with Local First Arizona. I don’t know what most of the food is but it’s all delicious. We ate way too much and it was totally worth it. I had heard of Melrose Pharmacy but I had never been here. It’s a charming little shop that is primarily a pharmacy with small retail area compared to other drug stores that are mostly retail and a little pharmacy. I love Changing Hands – the diverse book selection, the other items they sell, and their wonderful events. I rarely buy books because I usually check books out from the library if I only plan to read it once. However, when there’s something I want to own, it’s a great place to go. And I love that they buy used books. I have a stack of books from my minimalism project that I will be bringing to them with the hopes to exchanging them for store credit. I love Duck and Decanter. It’s a wonderful deli that has edible gluten-free bread and delicious sandwich options. They have excellent desserts too including amazing fudge. 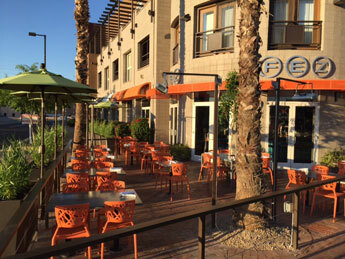 They have indoor and outdoor seating which makes it a wonderful place to enjoy a meal with friends. I love food trucks. I think the owners are determined and make themselves stand out in wonderfully delicious ways. I’m looking forward to the weather cooling down so I can get back to Food Truck Friday without having to worry about melting. Jamburritos is my hands-down favorite food truck. The Cajun-Mexican food is awesome and the staff is so sweet. I made the trek out to the Downtown Farmers Market (which is also awesome) just to pick up lunch. So that was my Indie Week 2013. I had an awesome time and it was definitely worth it to make my schedule work around these awesome deals. 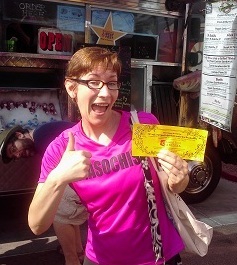 If you used your Golden Coupon somewhere in Arizona this week, I’d love to hear about it. Independents Week is coming up June 30 – July 7, 2013. I’m really excited for this week of celebrating independently owned business by getting awesome discounts. Since I joined Local First Arizona last year, I’ve learned a lot about the benefits of supporting local businesses. When you shop locally, not only are you supporting “the little guy,” you’re keeping more money in the local economy. I was amazed when I learned that for every $100 you spend at a big box store, only $43 stays in the local economy. 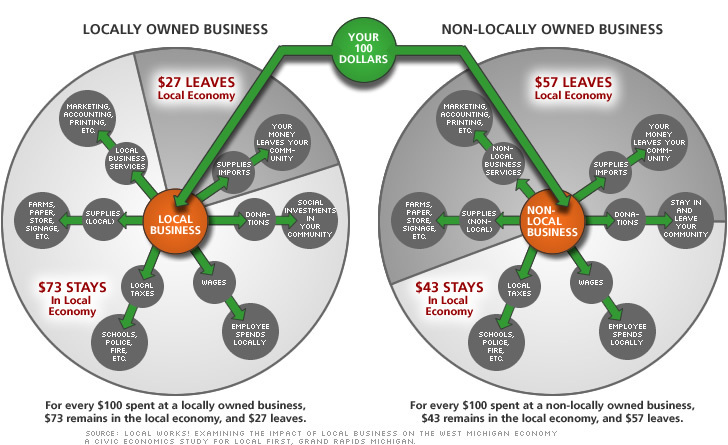 When you spend $100 at a local business, $73 stays in the local economy. To celebrate Independents Week, Local First Arizona created the Golden Coupon program where dozens of Local First members are offering a 20% discount if you shop with the Golden Coupon. The list is pretty extensive and diverse. The Dhada: This little Indian restaurant in Tempe will blow you away. Don’t worry if you’re unfamiliar with Indian food; everything here is fantastic. This was the first place I made sure was on my calendar for Independents Week. Some of the other great restaurants that are accepting Golden Coupons include Fez, Coronado Café, House of Tricks, Tryst Café, and Duck and Decanter. Urban Cookies: I’ve been looking for an excuse to indulge my sweet tooth. This is an award-winning bakery and they make gluten-free cookies and cupcakes. AZ on the Rocks: I really like this rock climbing center in Scottsdale. The staff is friendly and they have auto-belays so you can climb by yourself if you are so inclined. I’m really happy that this place is on the Golden Coupon list. Zia Records: Independents Week will hopefully be my first of many trips to Zia Records. They are known for being a great place to buy and sell CDs and DVDs and for finding obscure items that aren’t available in other stores or hellaciously expensive if you buy them online. Write On’s: This charming stationary and gift shop in Phoenix is part of my family. This is my go-to place when I need a greeting card or a classy gift. The women who work here are like a set of aunts. I love shopping here. And this is just the tip of the iceberg. Check out the full list of Arizona businesses that are accepting the Golden Coupon for Independents Week. It’s a great excuse to try someplace new and explore what’s available your community. Yes, even Carter Law Firm is participating in this year’s event. For those of you who don’t live in the Phoenix area or are looking to get out of dodge, a lot of businesses in the Cottonwood, Flagstaff, and Tucson areas are also accepting the Golden Coupon. Update: Be sure to check out these last minute additions that are accepting Golden Coupons – Jamburritos, Brand X T-shirts, and Changing Hands.